How many different kinds of wire are there? Are there benefits and drawbacks to each? ​Which brands make the best wire for vaping? And if you agree that $1 per foot of wire at vape shops is waaaayyy too steep, welcome to coil building paradise. If you already know all about kanthal and stainless steel, feel free to skip ahead. Everyone else—buckle up, because you’re about to receive a (brief) education in metal properties 101, which will help you when deciding which is right for you. The most common types of wire used for building coils are kanthal, nichrome, nickel, stainless steel, and titanium. I’ll be focusing on the best kanthal and stainless steel coils, mainly because of they’re both safe and easy to use, and stainless steel coils are known to be more durable than the rest while also providing exceptional flavor and cloud production. If you want to learn more about nichrome, nickel, and titanium wire, Mr. Long Drag has a great article that explains their qualities. It’s true that Kanthal has the slowest ramp-up time amongst them all, but it’s also very forgiving. When you’re just getting started, you don’t necessarily want your coils to heat up in a split second, and thanks to how durable and malleable it is, it’s easy to twist and braid without breaking. It’s already cheaper than all the rest, but even more so if you buy it by the spool. Stainless steel, on the other hand, heats up faster, lasts longer, and delivers better flavor than kanthal. While there’s nothing wrong with using nickel, nichrome, or titanium coils, just be sure you know what you’re doing first. For example, nickel coils can actually melt in your RDA if you bump the wattage too high. One last thing you’ll want to consider is the gauge (AWG) or thickness of your wire, which typically ranges from 22 to 34. The higher the number, the thinner the wire. The thinner it is, the more resistance per foot. Of course, the opposite is true of thicker one. If you’re new to vaping and aren’t sure what “resistance” even means let alone which gauge is right for you, be sure to check out our Sub-Ohm Vaping Safety article. Keep in mind that each brand offers an assortment of gauges and that these sizes serve only as examples. Any thickness can be made to chuck clouds, and there’s no #1 undisputed best brand. It all comes down to personal preference. 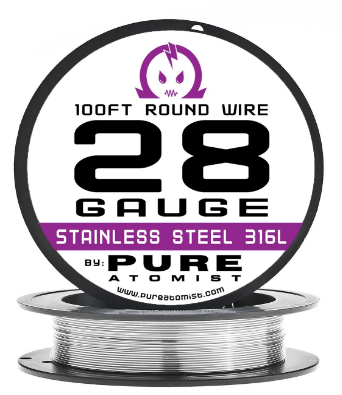 Pure Atomist has been around since 2014 and is one of the leading vape wire distributors in the United States. I wouldn’t recommend them if I haven’t used them, and I’ve never been disappointed with the quality of coils I’ve created with their Kanthal A1. A 100 ft. spool can be had for less than $6 on Amazon, and let me tell, that’s A LOT of it. 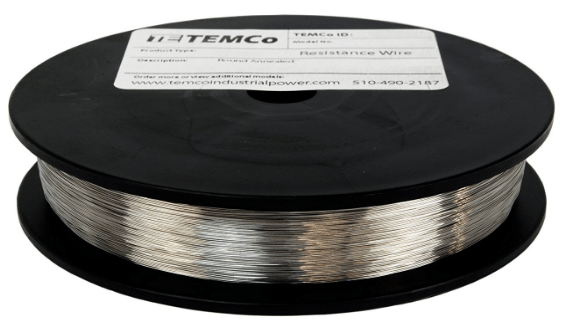 TEMCo’s wire might be a little more expensive at $6.45 for 100 feet, but it also has more reviews and the highest rating of any kanthal A1 I’ve found on Amazon. Is it any better? Not necessarily, but it’s always good to have options! Try it yourself and see what you think. 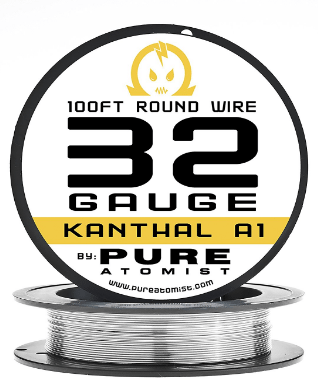 Just be sure you purchase the right gauge of wire. With a name like Master of Clouds, it should come as no surprise that these guys mean business. They make every type and thickness of wire you can imagine, and it’s their kanthal A1 that originally caught my attention. It’s extremely easy to work with and holds its shape very well. Perhaps the best wire for vaping I’ve used till date. Once you’ve got some experience under your belt and understand the relationship between amps, volts, and resistance, you’ll be ready to take on stainless steel coil builds. I recommend getting an ohm reader if you don’t already own one. The beauty of stainless steel wire is that the coils you make with it won’t succumb to oxidation as quickly as other metals, so they’ll last you longer. 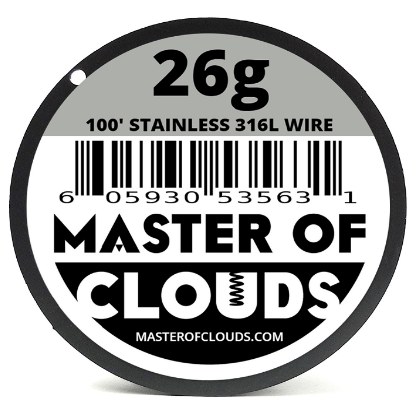 When you’re ready to discover how delicious e-juice can really taste, Master of Clouds has got you covered. Their 100 ft spool sells for as low as $7.99 and I’ve never had someone tell me they weren’t happy with the results they were able to get. There’s not a big difference in flavor or vapor production when you compare the stainless steel wire that Master of Clouds and Pure Atomist sell. They each have thousands of raving fans, and I can personally attest to the quality of them both. You’ll save an extra 50 cents buying this brand, but you and I both know that’s negligible, so go with whichever one you feel drawn to! Vaping has only been around for a handful of years and the truth is none of us were born knowing how to wrap coils. 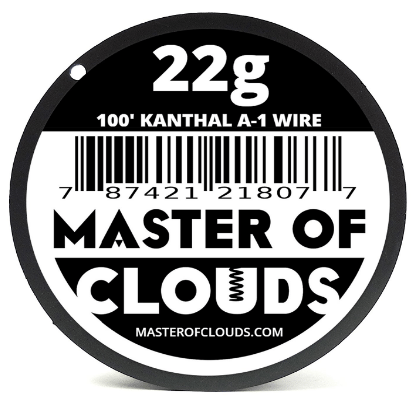 The quickest way to get better at it is to practice, and the best place to start is with kanthal. Before you know it, you’ll be making staple staggered fused clapton coils! But you absolutely have to understand how resistance works. If you’re a visual/auditory learner, the following video by Vapor Beast that explains watts and Ohm’s Law will be great for you.